I'm forever on the look out for terrestrial orchids of tropical origin that we can display in the Fuqua Orchid Center. The list of commercially available terrestrial genera just isn't that long or varied: Paphiopedilum (Asian Slipper) is, of course, one of our core collections. Phaius (Nun's Orchid) and its cousin Calanthe, wonderful though they are, become the kind of pest magnets that make me grind my teeth. The gorgeous Warrea and Gastrorchis can be elusive in commerce. Ludisia (Jewel Orchid) is for shady corners only. And Spathiglottis (Ground Orchid) is as utilitarian an orchid as you could ever hope to find. Habenaria, where have you been all my life? Meet H. rhodocheila, radiant gem from tropical evergreen forests in South China, Thailand, peninsular Malaysia and the Philippines, growing @1100 meters. H. carnea from 600 m. elevation on limestone in coastal southwestern Thailand. The epithet carnea refers to the flesh-toned flowers. And the otherworldly H. medusa, who we met earlier, grows @600 m. in Laos, Vietnam and the islands of Borneo, Sumatra and Sulawesi. Habenaria is, of course, a huge genus of over 500 species occurring in temperate and tropical regions across the globe. The temperate zone species are not so amenable to cultivation. But the three tropical species above are. For most of the year growing these three terrestrial tropical orchids really isn't so different from growing Ludisia discolor, the common Jewel Orchid--warm temperatures, subdued light and even moisture--with one important important difference. The three Habenarias above go dormant. They key to success lies in knowing when and to what degree. What's the deal with the dormancy? Lots of orchids respond to a pronounced cold and/or dry season in their natural habitat with some degree of dormancy. Epiphytes from seasonally dry tropical forests, like Catasetum and Mormodes, shed their leaves at roughly the same time every year as a normal part of their annual growth cycle, leaving behind only pseudobulbs and roots. Terrestrials that experience seasonal drought in the tropics, like these three Habenarias, shed the entire above ground portion of the plant, leaving only the subterranean tuber to sustain the plant. 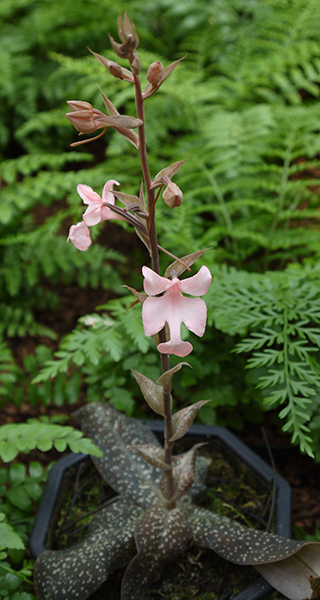 If you purchase your Habenaria in flower (mid-Aug. to mid Sept. here) you can expect it to wrap up its growing season a few weeks after it finishes flowering. At the first sign of withering leaves you should taper off the frequency of watering. Don't be shocked when one day you discover that the entire above-ground portion has collapsed. The tuber is fine. Just gather up the remains of the leaves and discard them. No need to unearth the tuber, but don't forget about it either. To keep it from dessicating you will need to water the pot occasionally throughout the dormancy. 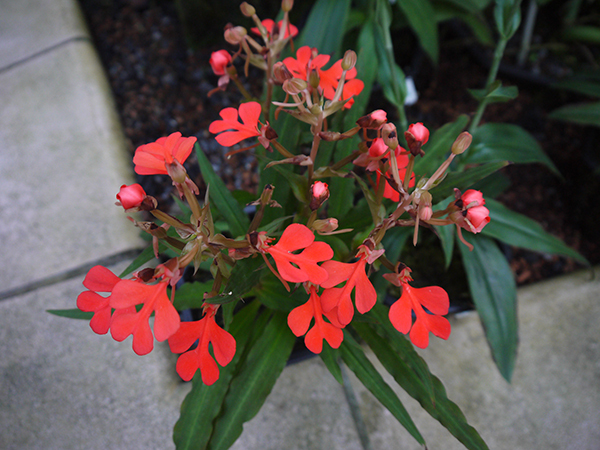 We allow our Habenaria pots to achieve 'bone dry' status, wait about 48 hrs., and then water. Don't make the mistake of thinking that your plant needs no water during its dormancy based on reports of zero rainfall in Thailand. Your house/greenhouse is not like tropical Thailand. Fast forward to mid-spring. One day you will peer into that long empty pot and, behold, a new shoot. Handshakes all around. In Indianapolis Will Rhodehamel of Hoosier Orchids uses tax day, April 15, as his reminder to start watering his Habernarias. We're about a month earlier here in Atlanta. The start of your season will vary from year to year and depend on your latitude and growing parameters. You can repot the tuber just before growth commences ~February or while the growth is young (gently, please). As a potting mix consider a sterile soilless medium that approximates the water and air holding capacity of actual soil--peat, ground coir or milled sphagnum-based mixes for example. That's pretty much it. Have fun with these!